Finding your stolen car is not exactly common, but it does happen. Sometimes it’s through considerable effort, and very rarely it’s through sheer dumb luck. A cyclist in Venice, CA, over the weekend fell into the dumb luck method when he happened to spot his wife’s stolen Mazda CX-5 driving around. The person driving the car then decided to go for a little jog. I like the lackadasical “Woooorrrlldstar” the person shooting the video mumbles as the woman runs away. The cyclist’s car-recovery method is pretty good. 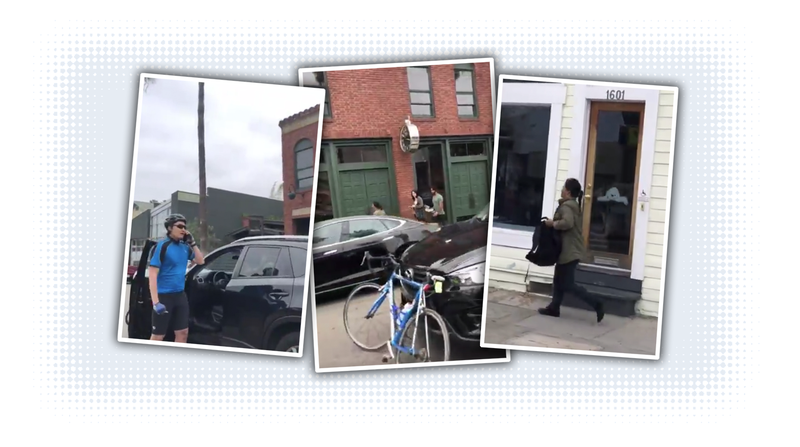 He seems to have used his bike to block forward progress of the car (I mean, I guess it could have just run over the bike, but it’s in traffic) and by stopping all traffic on busy Abbot Kinney Blvd., he’s making a scene where everyone is watching, which is likely good. And, of course, he’s calling the cops right away. The woman driving was 39-year-old Erica Puig, according to ABC7, who was eventually caught and held by witnesses until police arrived. I guess the takeaway here is that if you’re going to steal a car, don’t drive it within cycling distance of where you stole it, dummy.